The world already knows the new Macbook, which is not neither a Macbook Air nor a Macbook Pro. It’s the THINNEST Macbook Apple has ever built. Bigger keyboard with new technology. The thinnest and lightest Macbook ever built. The most energy efficient screen. Apple has always been a pioneer on new technology standards, I remember Firewire and now USB-C. Which is a step forward due to the fact that is a reversible port, which means its easier to plug anything into it; whether is a portable hard drive, secondary screen, printer or what not. 3 different colors. Just like the iphone this new macbook comes on three different colors, Gold, Space Gray and Silver. 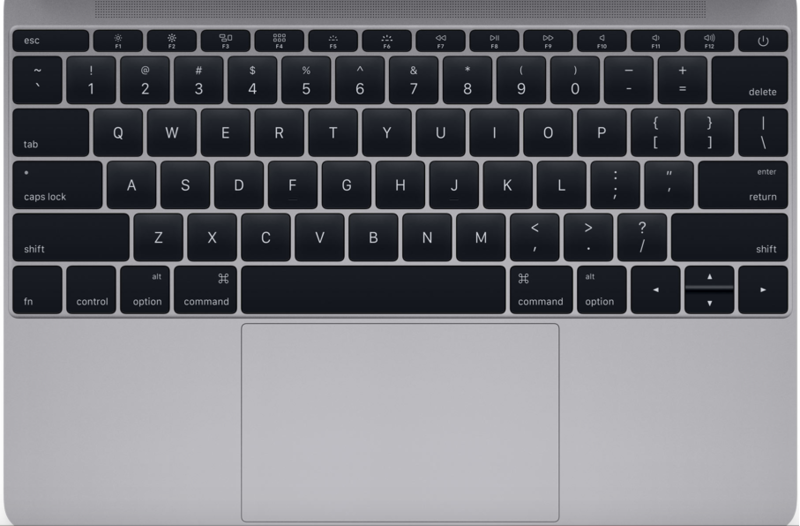 Apple has reinvented the chiclet keyboard so it could be thinner for this New Macbook. And they certainly did, They even increased the size of each key and reduced the space between them. Also, a new LED system has introduced that now lights each key individually. This, Apple claims, also helps on reducing the electricity consumption. New Trackpad with force sensor. Apple has now incorporated the force sensor on its trackpad as well as some haptic feedback to feel the buzz. The force sensor is something that Wacom tablets have incorporated long ago, and many, many Graphic Designers have learned to love and use on their day to day operations. Battery life is something that has become really important for me, as I do like to move around the house when I work. I ditched my Dell XPS 14 in favor of a Macbook Pro 13″ Retina for that same reason. Not much for the OS, but for the amazing battery life. And now with the improved layered batteries on the New Macbook, Apple claims you will have a ALL DAY battery life; which it’s really 9 hours of battery life. (Apple is great at marketing). The processor is slow because it’s energy efficient. It’s 1.1GHz. My Smartphone has more CPU power than the new Macbook. This CPU is half Intel Dual Core and the other half Intel Atom. This basically means that you are going to have a premium priced Chromebook or Netbook like the Acer Aspire One series that are targeted for a specific demographic of low income. To summarize this is slow. 1 single USB-C port. This is used for accessories, charging the computer, printers and what not. I do wonder how’s it going to work if you want to attach a secondary display ? It would be either you have 2 screens or you charge the computer or would the computer pull electricity from the monitor via USB-C. I do need to answer this concern I have. Too thin. Why it’s on my con’s list you might ask? Well, remember the bendgate? I am certainly afraid that this baby might break or bend. So I would stay away. The new Macbook is certainly pretty and light. It has great battery life, but it is not the powerhouse I am used to use for my work. This new lineup item, is targeted for the masses, for folks who only need to use a browser, email and some office software like word processors, spreadsheets and presentations. If you are an IT Pro, a Power user, Designer or basically need computing and rendering power to do many things at onces, this is NOT a computer for you.